The Supreme Court’s judgment on triple talaq or instant divorce will end the pain inflicted on many Indian women in the garb of faith. The practice has been held unconstitutional by a majority vote of 3:2. The court also ruled that this is not an integral part of Islam. Fortunately, there were plenty of signals to indicate that a large cross-section of people across the country wanted this primitive and medieval practice to be quashed as early as possible. The five-judge Constitution bench of the apex court, which delivered its historic verdict on triple talaq (talaq-e-bidat), polygamy and nikahhalala, was headed by Chief Justice of India Jagdish Singh Khehar. Justices Kurian Joseph, Rohinton Fali Nariman, Uday Umesh Lalit and S Abdul Nazeer made up the bench. After hearing prolonged arguments, the bench had reserved its verdict on a clutch of petitions, including the one by Shayara Banu, who challenged the Muslim Personal Law and its retrograde practices. The court had already indicated that the fundamental rights, as well as human rights of an individual, cannot be exploited in the name of religion or on the basis of gender. Last December, the Allahabad High Court had ruled that the right of Muslim women, or anyone for that matter, could not be infringed upon even if it is dictated by personal law. Asserting that divorcing a woman by merely uttering the word talaq three times in quick succession is unconstitutional, the High Court observed that no Muslim husband should give divorce in a manner that would put a question mark on equal rights. The case in the Supreme Court and the arguments put forth increased awareness among Muslim women about their rights. These arguments also exposed the hollowness of the stand taken by the Muslim Personal Law Board (AIMPLB) that triple talaq was sanctioned by the Quran, the holy book of Muslims. Most Muslim women had thus far kept quiet assuming it was a religious obligation, as prescribed in their holy book. But it can unequivocally be said that they must have breathed a sigh of relief with the practice having been held contrary to the Indian Constitution. Over six days during the summer vacation, the Supreme Court heard arguments by several parties, which included the Centre, the All India Muslim Women Personal Law Board, the All India Muslim Personal Law Board and various others. During the hearing, the bench asked “how can a sinful practice be said to be a matter of faith”? They also noted that the “system itself says it is horrendous and bad” and that other Islamic countries have abandoned the practice of triple talaq. Asserting that if it is bad in theology, it cannot be accepted in law, the bench observed, “What is morally wrong cannot be legally right. What is not fully moral, cannot be legal.” Arguing that triple talaq cannot be integral to Islam, Shayara Banu’s advocate Amit Chadha said many schools of thought do not recognize the patriarchal practice of triple talaq in a male-dominated community. It is an undesirable, bad, and sinful practice and violates constitutional guarantees of Muslim women, he added. According to senior lawyer Anand Grover, who was appearing for an organization opposing triple talaq, most Sunni Muslim women were not only against this practice, but the AIMPLB was not giving a correct perception to the Supreme Court. Arguing for the All India Women Personal Law Board, Islamic scholar and lawyer Arif Mohammad Khan, who is also a former Union minister, strongly objected to the submissions of the AIMPLB. He said that Islam cannot have any room to dictate to any person and the Quran says that killing an innocent person was like killing the entire humanity. Khan, who had resigned from the Rajiv Gandhi cabinet over differences in handling the Shah Bano case, further said that Shariat law had been distorted. Stating that Shariat is the holy Quran and not the opinion of clerics, he said since the Quran considers the importance of family, it prescribes four steps before pronouncement of divorce. The bench after hearing the arguments said it would examine whether the practice of triple talaq is fundamental to Islam. It had also said it would not consider polygamy and ‘nikah halala’ for the time being but would take them up at a later stage. The Supreme Court had taken suo moto cognizance of the question whether Muslim women faced gender discrimination in the matter of divorce or due to polygamy. The Centre had earlier said that triple talaq is neither integral to Islam nor a “majority versus minority” issue, but it is rather an “intra-community tussle” between Muslim men and deprived women. “It is not only not an essential part of the Muslim religion,” lawyer Chadha said, “it is not a part of religion at all. On the contrary, it is deprecated by Islam”. He was responding to AIMPLB’s assertion that triple talaq, though sinful was a matter of faith for the Muslims. The court had also taken note of repeated submissions by the AIMPLB and former Union Minister and senior lawyer Salman Khurshid, who was assisting it in his personal capacity, that triple talaq is not mentioned in the Quran and is “sinful”, “irregular”, “patriarchal”, “bad in theology” and “undesirable”. But he argued that court should not examine it. Citing the current scenario where Muslim women are protesting against instant triple talaq, Grover, who was appearing for Zakia Suman, cofounder of the Bharatiya Muslim Mahila Andolan, questioned the AIMPLB’s claim that they were discouraging the practice of triple talaq among Muslims. Grover also contested AIMPLB’s claim that its voice was representative of the Muslim community. Pointing out that talaq-i-bidat is not an essential part of the Sunni Muslim faith, he emphasized that it had been changed in several Sunni-majority countries. It is apparent that even AIMPLB realizes that triple talaq cannot be continued as it is being practised today. That is the reason why it told the court on the last day of arguments that it had decided to issue an advisory to qazis (Islamic judges) to give an option to all Muslim women to opt out of instant triple talaq before giving their consent for marriage. The clerics’ body was well aware of the mass petition by the Bharatiya Muslim Mahila Andolan (BMMA) demanding a ban on triple talaq. It was signed by more than 50,000 Muslim women and men. The petition also sought the National Commission for Women’s intervention to end this “un-Quranic practice”. The Mahila Andolan collected signatures from across the country, including in such states as Gujarat, Maharashtra, Rajasthan, MP, Karnataka, Tamil Nadu, Telangana, Odisha, West Bengal, Bihar, Jharkhand, Kerala and Uttar Pradesh. According to the Association, 92 per cent of Muslim women want an end to instant divorce. The court was aware of the fact that Muslim women are subjected to unjust, unilateral divorces. Often, talaq is pronounced over the phone, through text messages, over social media or via email. In such circumstances, women have no recourse to justice. The divorced women have no legal rights, and the qazis always support the men. This formed the very basis of the landmark judgment. In September 2016, the clerics’ body argued that the provision of triple talaq actually protected women since it removed the need for husbands to kill their wives. “If there develops serious discord between the couple, and the husband does not want to live with her, legal compulsions of time-consuming separation proceedings and expenses may dissuade him from taking the legal course. In such cases, he may resort to illegal, criminal ways of murdering or burning her alive,” it said in an affidavit. In Pakistan, for a man to obtain a divorce, he has to send a notice in writing to the chairman of the local council with a copy to his wife. He has to wait for 90 days during which time an arbitration committee tries to bring about reconciliation between the parties. Turkey, another Muslim-majority country, abolished triple talaq in 1926. The island country of Cyprus too followed suit. In Egypt too triple talaq is illegal. Since all this information is in the public domain, Muslim women in India are aware. So they chose not to sit quietly and fought to free themselves from this oppressive and retrograde tradition which is being perpetrated by the Orthodox clergy. The key takeaway of the judgment is that even the judges in a minority wanted the practice to be banned for six months till the government passes new legislation while keeping in mind the demands of all stakeholders. 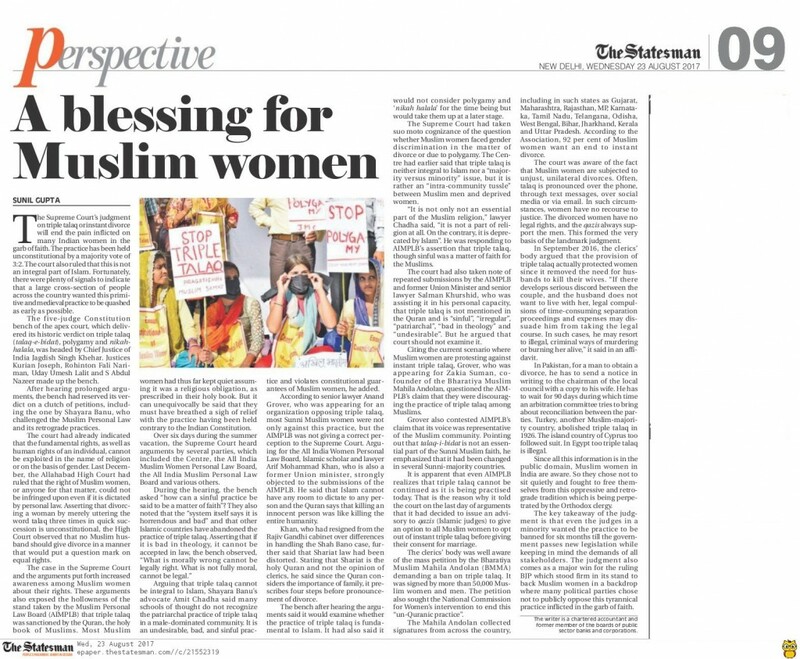 The judgment also comes as a major win for the ruling BJP which stood firm in its stand to back Muslim women in a backdrop where many political parties chose not to publicly oppose this tyrannical practice inflicted in the garb of faith. This entry was posted in blog on August 23, 2017 by admin. 3:2 majority for such a crucial matter! It should have been 5:0. But at last we are content that this has come. No body was in favour of triple talaq that ruins lives of innocent women. What about the cases where triple talaq was done and husbands married other woman? Will this judgement make all those past divorces null? Win for all those women who had suffered miseries due to instant divorce by their husbands. Indian Constitution is the best in world and our judiciary upholds its tenets. I wholeheartedly welcome the S C’s judgement. Whoever supports this triple talaq, should be asked if the same thing is done by his father, will he be happy? With whom he will stay-father or mother? and why not with both of them? Religion is a matter of community and courts should have no right in judging issues related to religion. If the community did not feel that Triple Talaq was bad what was the need to make it illegal? Court has shown the men that they can not be biased towards the rights of women. This is a landmark judgement and it will set a precedent for equal rights among genders. Rajiv Gandhi was an utmost corrupt politician who brought law to curb women rights. In contrast we have Narendra Modi who was unbiased and did not fear any negative consequences. We can become a New India only when we start reforming our religious flaws on our own and do not rely on judges and governments to this for us. Time to rethink. I feel pity for those who are saying that PM Modi is responsible for court’s judgement. What about the hardwork of petitioners and their lawyers? A major credit goes to BJP government which backed the petitions of women and conveyed to the court that Triple Talaq is unconstitutional. Muslims should start trusting BJP now. It is now on Muslim clerics to make sure that implementation of this verdict is carried out in letter and spirit. Many a time communities disregard laws and follow customs that are backward.